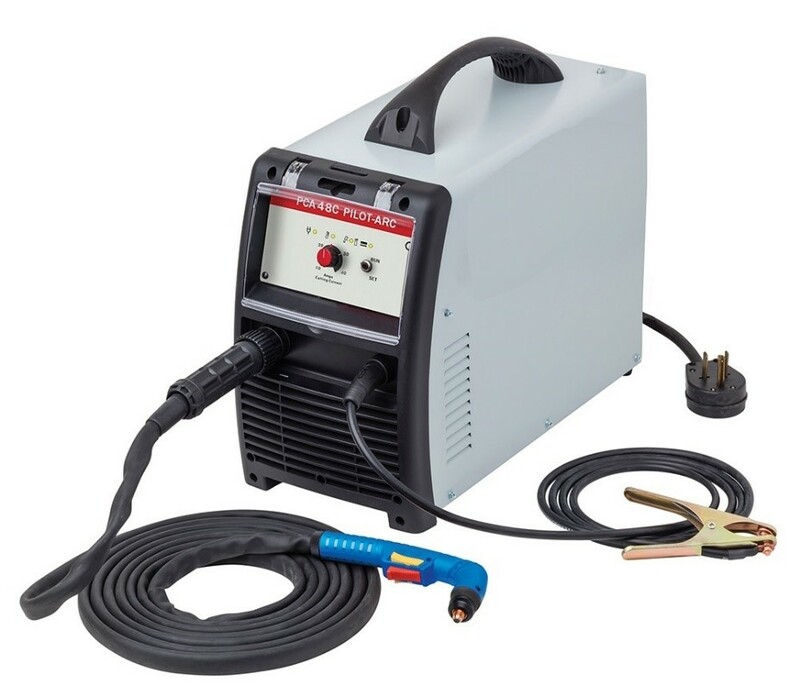 The model 40 plasma cutter is the choice of professionals, with 40 amps of cutting power to slice through bare or painted 1/2” steel and sever to 1” thickness. It’s completely versatile with dual 110-240 volt input capability and adjustable output power for controlled cuts on thin sheet to thick plate materials including carbon steel, stainless steel & aluminum. System features IGBT inverter power supply with epoxy sealed components and dual voltage PFC line input in a compact toolbox grade steel air-cooled cabinet with the highest duty-cycle rating in class. Operating features include infinitely variable output power from 20-40 amps, sure-fire pilot arc ignition (no noisy HF), high visibility LED status indicators, auto/manual torch air purge, adjustable air regulator/dryer with pressure gauge and quick connect UV/IR welding cables on NPT48 cutting torch & work clamp for easy storage. Unit is available with Automatic CNC interface connection. Package includes, inverter power supply with compressed air filter/dryer & gauge, NPT48 plasma torch 4M, 200A work clamp 4M, 115-volt & 230-volt power plugs, 5-spare cutting tips, 3-spare electrodes and operator manual with complete cutting instructions & listing of maintenance parts. 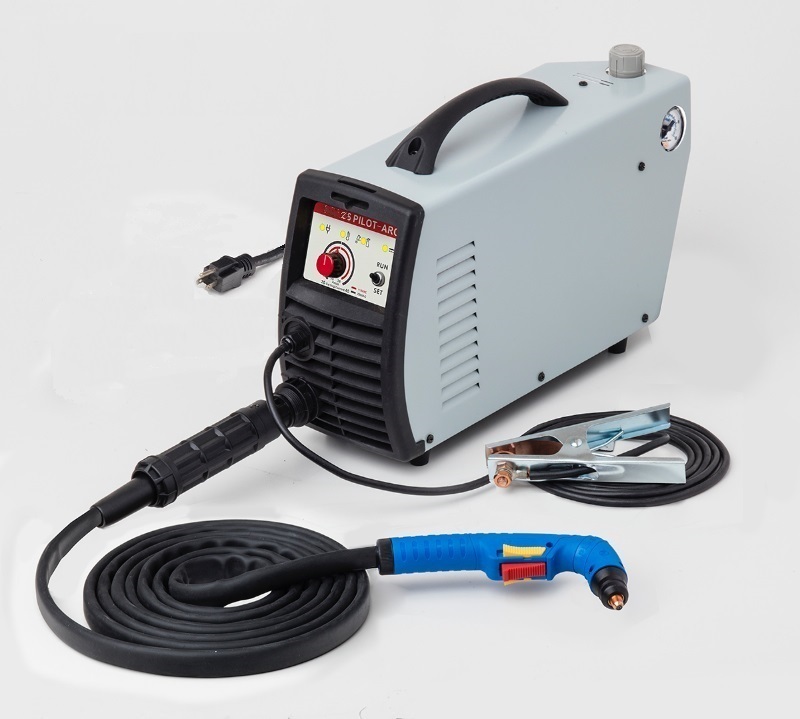 The model 40C plasma cutter is the choice of professionals, with 40 amps of cutting power to slice through bare or painted 1/2” steel and sever to 1” thickness. It’s completely versatile with a built-in air compressor allowing for NO SHOP AIR! This completely portable cutting system offers adjustable output power for controlled cuts on thin sheet to thick plate materials including carbon steel, stainless steel & aluminum and has a convenient torch & clamp cable storage cabinet. System features IGBT inverter power supply with epoxy sealed components and twin-piston air compressor in a compact toolbox grade steel air-cooled cabinet with the highest duty-cycle rating in class. Operating features include infinitely variable output power from 20-40 amps, sure-fire pilot arc ignition (no noisy HF), high visibility LED status indicators and quick connect UV/IR welding cables on NPT48 cutting torch & work clamp for easy storage. Package includes, inverter power supply with compressor, NPT48 plasma torch 4M, 200A work clamp 4M, 230-volt power plugs, 5-spare cutting tips, 3-spare electrodes and operator manual with complete cutting instructions & listing of maintenance parts. The model 60 plasma cutter is the choice of professionals, with 60 amps of cutting power to slice through bare or painted 3/4” steel and sever to 1-1/4” thickness. It’s completely versatile with 208-230 volt, single-phase input capability and adjustable output power for controlled cuts on thin sheet to thick plate materials including carbon steel, stainless steel & aluminum. System features IGBT inverter power supply with epoxy sealed components in a compact toolbox grade steel air-cooled cabinet with the highest duty-cycle rating in class. Operating features include infinitely variable output power from 20-60 amps, sure-fire pilot arc ignition (no noisy HF), high visibility LED status indicators, auto/manual torch air purge, adjustable air regulator/dryer with pressure gauge and quick connect UV/IR welding cables on NPT68 cutting torch & work clamp for easy storage. Unit is available with Automatic CNC interface connection. Package includes, inverter power supply with compressed air filter/dryer & gauge, NPT68 plasma torch 4M, 200A work clamp 4M, 208-230-volt power cord with plug, 5-spare cutting tips, 3-spare electrodes and operator manual with complete cutting instructions & listing of maintenance parts.